Ahavat Torah In the News! 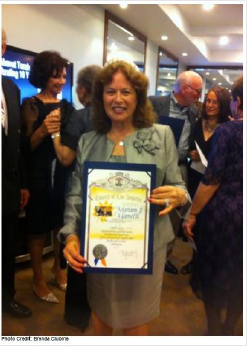 Rabbi Miriam E. Hamrell was honored by councilman Zev Yaroslavsky at a gala held on May 4, 2013 in Los Angeles. This award was granted by the Board of Supervisors of the County of Los Angeles for, "Ten years of service as a motivational leader, teacher and founder of Ahavat Torah synagogue" and signed by Zev Yaroslavsky. She holds the unique and distinguished honor of being the first and only Israeli born and raised woman to head an American Jewish congregation for the past ten years. Her life story reads as a fascinating journey through a great variety of spiritual and cultural expressions of contemporary Jewish life. She is a leading personality, spokesperson and ethicist for the Jewish community, served in the Israeli Defense Forces and has counseled, taught and inspired numerous women with her prison work. a warm and spiritual Jewish community in West Los Angeles where each person’s presence is acknowledged and valued. Members are drawn together by a love of Jewish prayer, ethics, culture and tradition - 343 Church Lane, Los Angeles, CA 90049 310.362.1111 (www.ahavattorahla.org) New members are welcomed. In March 2012, Rabbi Miriam was an invited speaker at a symposium addressing the values and beliefs shared by the three Abrahamic traditions. The meeting at the Academy for Jewish Religion, CA attracted over 150 attendees and consisted of presentations by Jerry Campbell, PhD, President of Claremont School of Theology; Jihad Turk, Director of Religious Affairs, The Islamic Center of Southern California, and Interim Dean, Bayan Graduate Program at Claremont Lincoln University; Rabbi Mel Gottlieb, PhD, President of the Academy for Jewish Religion, California and Vice President of Claremont Lincoln University; and our own Rabbi Miriam Hamrell. A video podcast of the event is now available at http://www.youtube.com/v/ltJqvliHY74&autoplay=1. Over the years, Muslims, Jews and Christians began inviting one another regularly to holiday celebrations. The three communities share the task of putting up decorations and set aside time during events to educate their counterparts about the meaning of sacred rituals and customs. TV interview with Rabbi Miriam - Bosnia-Herzegovina, 2011. In 2011, Rabbi Miriam had an amazing trip to Bosnia-Herzegovina, scheduled by the American Embassy, with the cooperation of the Bosnia-Herzegovina Education Department. She met in the Parliament with the Minister of Education, who expressed his desire to promote more multi-religious studies in all public and private preschools, primary schools and universities. Rabbi taught 'Judaism 101' to 125 Muslim school teachers and principals. She gave a lesson on Mussar, Jewish Ethics, to Muslim students, on the topic of V'Ahavta L'reaha Kamoha, Love Your Neighbor as Yourself. The students had questions about Judaism, and the relationship between Jews and Muslims in the USA. They were stunned to hear that we have three women leaders of the three Abrahamic faiths, coexisting and cooperating, under one roof. They could not comprehend how this works. Rabbi Miriam was welcomed by the President of the Jewish Community, and received gifts of a glass cube, etched with a picture of the Sarajevo synagogue, a CD, and a book on the famous Sarajevo Haggadah. She gave a TV interview as part of the Women's Empowerment Program where she shared her own experience of achieving, after many decades, her dream to become a rabbi (the segment showing Rabbi Miriam begins at 14:19). She urged the audience of mostly Muslim women not to give up on their dreams. Rabbi Miriam Hamrell, who runs a congregation called Ahavat Torah inside the Village Lutheran Church in Brentwood, ... has a gentle, loving face, but her expression tells you she's not easily impressed. Through her Israeli accent, her words come out with sweetness and serenity. It's clear that she takes words very seriously. At the LimmudLA conference, she was giving a class on her lifelong passion: Mussar. The Mussar movement is one of those little-known undercurrents initiated in the Orthodox world that gets little attention. Founded by the 19th century Lithuanian Talmudic giant Rabbi Israel Salanter, Mussar is a Torah-based system of internalizing the central values of religious, moralistic and ethical teachings into one's personal life. In other words, it's a guide on how to perfect our characters and deal with each other. The class I attended was on "Embarrassments and Insults." After a brief introduction and history of the Mussar movement, Hamrell laid out some definitions, and then, slowly and quietly, began to make us uncomfortable. Eventually, she moved in for the kill and said something that made a few of us squirm. Public humiliation is like murder, she said. The rabbi delved into numerous Torah sources, but one quote stood out for me: "One who shames his fellow in public, is as if he shed blood" (Talmud Berahot 58b). Hamrell was relentless but serene, as if to say: Don't kill the messenger, this is your Torah. In addition to Torah law, she quoted several biblical stories to reinforce the notion that few things in the Torah are seen in a worse light than public humiliation. Her talk was disturbing, but I wanted to know about the embarassing e-mails: Was the act of publishing them akin to shedding blood? Wasn't there a Torah exemption for reporters seeking to inform readers? I caught up with the rabbi on the last day of the conference and asked her point blank: Where do the Torah obligations of a Jew end and the obligations of a reporter begin? "Your obligations as a Jew never end," she said. "Your professions can come and go, but your Torah and your Judaism will never go." Don't call them synagogues. They are minyanim, or spiritual communities. They have evolved from shared and individual dreams and from serendipitous, profound and beshert connections. They are new, egalitarian, independent, warm, collaborative and vibrant. And they are all led by female rabbis. Ahavat Torah, with Rabbi Miriam Lefkovits-Hamrell, meets Saturday mornings in rented space ...in West Los Angeles.